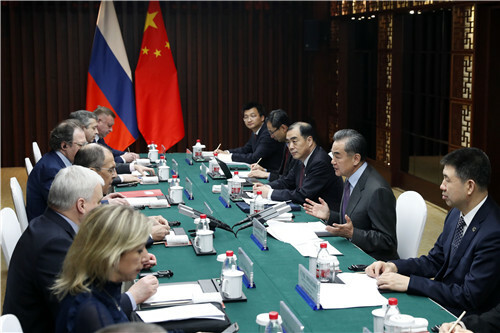 On February 26, 2019, State Councilor and Foreign Minister Wang Yi met in Wuzhen of Zhejiang Province with Foreign Minister Sergey Lavrov of Russia, who was in China for the meeting of Foreign Ministers of China, Russia and India. Wang Yi expressed that this year marks the 70th anniversary of the founding of the People's Republic of China and the 70th anniversary of the establishment of diplomatic relations between China and Russia. It is a very important year. Both sides should carefully prepare for the exchanges between the two heads of state within the year and hold the series of celebration activities focusing on the 70th anniversary of the establishment of diplomatic relations, in a bid to push bilateral relations to a new height and for greater development. Confronted by a complicated international situation, China and Russia, as comprehensive strategic partners of coordination, should further strengthen strategic communication, deepen strategic coordination, safeguard common interests, and make new contributions to promoting world peace and development. Wang Yi said that China, Russia and India are major countries with international influence and are also representative emerging markets. Strengthening communication, coordinating stance and deepening cooperation among the three countries are of great significance to the region and the world. The leaders of the three countries successfully held meetings in Argentina last November, which charted the course for and inject momentum into trilateral cooperation. The Chinese side is willing to make joint efforts with the Russian side and the Indian side to push the meeting of Foreign Ministers of China, Russia and India for substantial outcomes and to inject more positive energy into the unstable and uncertain international situation. 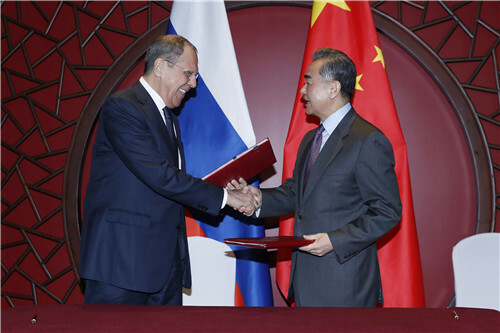 Sergey Lavrov agreed with Wang Yi's evaluation and suggestions on bilateral relations. Sergey Lavrov said that the Russian side stands ready to, together with the Chinese side, well arrange exchanges between the two heads of state and well implement the consensus reached by the two heads of state to push Russia-China relations for more positive outcomes on the occasion of the 70th anniversary of the establishment of diplomatic relations between the two countries. Amid complicated international situation with profound changes, it is necessary for Russia and China to maintain close communication and coordination, and jointly safeguard multilateralism and the basic norms governing international relations. The Russian side will work closely with the Chinese side and the Indian side to well hold the meeting of Foreign Ministers of Russia, China and India and push trilateral cooperation to new stages. The two Foreign Ministers also exchanged views and coordinated stance on the Korean Peninsula situation, the situation in Venezuela, the Afghan issue, the Joint Comprehensive Plan of Action on the Iranian nuclear issue, and other international and regional hotspot issues of common concern. The two sides also signed a consultation plan between the two Foreign Ministries in 2019 after the meeting.